The management team of Engineered Bonding Solutions, LLC comprises well over 50 years of combined experience in the composites and structural adhesives market. 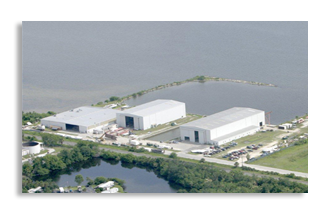 Our new production facility, located on the Indian River waterway in Titusville, Florida, features state of the art mixing and packaging equipment. Acralock adhesives are capable of bonding a wide range of these materials either to themselves or cross bonded to a dissimilar substrate, with little to no preparation. Our formulations are designed to provide very tough and durable bonds with high shear strength and elongation properties. This makes Acralock adhesives the best choice for applications that need to withstand harsh environmental and shock load conditions. The rapid cure nature of these adhesives at room temperature substantially decreases the assembly process time and increase production. Contact us by email at info@acralock.com for more information or to speak with a structural adhesive expert. Inside the USA toll free at 1-855-411-GLUE. Outside the USA, please call +1-321-747-0160.